Crawley Town boss Mark Yates believes his squad has been too few in number to survive an English football season. And he admitted some of them have lost their spark after such an exhausting schedule. Yates said: “The numbers that we’ve had haven’t been what a professional football club requires and I think a few of them have shot their bolt if you like. “One or two are dead on their feet. We are picking up one or two injuries and we have a lack of goals is evident at the moment, I fully understand that. “But it’s what we’ve got, we’ve kept them up! 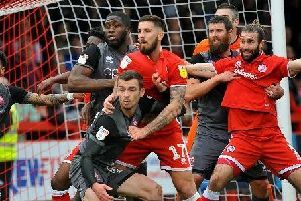 Yates praised the display of striker Gavin Tomlin in the first half and reckoned his replacement in the second half, Roarie Deacon, should have scored. He said: “Gavin offered a real good threat for us in the first half.